The church and possibly the parish of St. Michael, Great Creaton, may have been founded in the late eleventh or twelfth century. This was a period when many parishes were created in England. Little Creaton historically belonged to the parish of Spratton and its parishioners were obliged to use the church in that village. The earliest fabric of St Michael's church dates to this time, for the north doorway is of twelfth century date, as are the roof bosses at the beam ends, and the tower was probably built in the thirteenth century. By the later middle ages the church had been much embellished inside. We learn from wills and studies of the extant fabric that there was a rood screen, a painting of Saint Michael, several altars and saints’ images, including those of the Virgin Mary, Saints Christopher and George. Pious parishioners left money for lights to burn before images of these saints, for vestments and mass books. In the fifteenth century, the chancel was rebuilt and in the early sixteenth, the roof repaired. Most of these furnishings disappeared during the Reformation of the sixteenth century. The religious upheavals of the Tudor period had two results for the church of St Michael's. Firstly, there was a rise in non-conformity or Puritanism, a movement which has continued in importance in the village down to the present day. When Archbishop Laud's representatives visited the parish in 1637, the altar was found to be in the centre of the chancel, railed around, like the present day arrangement of Staunton Harold church in Leicester-shire. The parishioners were ordered to move it against the east wall of the chancel, in accordance with Laud's injunctions. Secondly, the fabric of the church had fallen into disrepair and improvements were ordered. There was some refurbishing of the interior of the church: the pulpit and tower arch rails are Jacobean and four of the tower bells date to 1635/6. The rector of Creaton may also have been Puritan in sympathies: the reverend Francis Markham, a relative of the lords of the manor, continued as rector throughout the Civil War and is said to have accepted Presbyterianism. On his death, shortly after the Restoration in 1661, a dispute between dissenters and conformists forced the new rector from office and a split in the parish community. The predecessor of the URC was formed in 1671: those who would not conform to the new prayer book formed their own church, finally given full legal sanction in 1690. 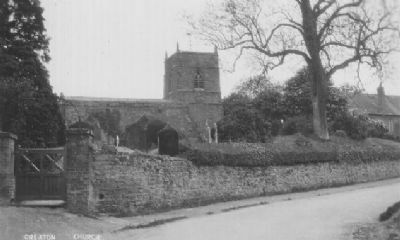 The parish church continued to be the focus of worship for many parishioners and to be the only legal place for baptism, marriage and burial for the community during the eighteenth century (parish registers date from 1688). The Markhams had made a number of floor memorials for family members buried in the chancel and nave, now lost. Most of the period was quiet for the Anglican community, but this changed with the Evangelical revival at the end of the century. The Reverend Thomas Jones began an active ministry as curate in 1785, following another Evangelical curate in this post. (See ‘Highgate House’, page 14) He gave sermons twice a week, held prayer meetings in outlying farms, founded one of the earliest Sunday schools in the county, a clothing and coal club for the Creaton poor and almshouses on the green for six elderly widows. In addition, he undertook important building work and repair on the church. A south porch, ruinous for two hundred years, was demolished and a south transept built in 1795. A gallery was added to the west end of the church and a vestry room, used as an office and school room, was built with a fireplace (the chimney can still be seen from the exterior of the church). The congregation increased - indeed he remarked that the church was full on Sundays in one of his letters of 1795 - and extra seating was necessary. The Victorian period saw further important changes in the design of St. Michael's: the church as a community and place of worship was extensively modernised. In 1844, during the ministry of John McCormick, the mission of the church was furthered by the founding of a National School, by subscription. During that of Edward Crow, in the 1850s many of the medieval and eighteenth-century features were torn down and the church refitted. The south transept was removed and a south aisle added, the roof was rebuilt and the pulpit moved to its present position. The rood screen and, probably the gallery, were removed to allow for focus on a refitted chancel and high altar. Further patronage followed after 1880, by Mr and Mrs William Musgrave Wroughton of Creaton Lodge. The organ was added in 1888, the reredos and sanctuary lights were given and a chancel screen was erected in the 1890s. The first half of the twentieth century witnessed further additions to the church. Memorial windows were put into the south aisle in 1905. After World War I, monuments were raised to men lost in the war, and a churchyard memorial erected in 1924. 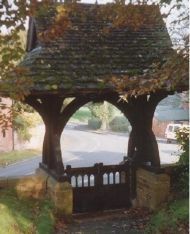 The cemetery was extended in the 1920s and 1930s and a lych gate added, in memory to Mr Wroughton who was killed in a riding accident. Since the Second World War the church has remained largely unaltered. The livings of several local parishes have been combined - the current incumbent serves Spratton, Maidwell, Creaton and until 2001 Draughton and Lamport. The church continues to be the focus of rites of passage and community commemoration. The last few years have seen necessary restoration of the fabric: work has taken place on the tower and there is currently a programme to illuminate the church. This article has been reprinted from Creaton Past & Present.